It’s been said time and time again, that every successful Leeds United team has had it’s midfield warrior at the heart. The last time we found ourselves fighting our way back into the top flight, the second greatest fiery red-headed Scot in the history of Leeds United football club played a pivotal part in that success. The first of two inclusions from the Howard Wilkinson side that won promotion in 1990 and went on to win the top flight in 1992, David Batty’s reputation alone was enough to make the opposition think twice before trying to run with the ball through the centre of Leeds United’s midfield. Batty was in many ways, the complete midfielder. His tough-tackling and tireless approach to the game were no doubt his defining attributes, but David Batty was also a master of pinpoint passing and was often the catalyst for many a Leeds United goal. His one fault however was the lack of goals he scored. Over the course of his two spells at Leeds United, Batty made over 300 league appearances, finding the back of the net just four times. In his second spell with the club, his lack of goals led to chants of ‘shoot’ from the Elland Road faithful every time he picked up the ball, regardless of how far away from goal he may have been. Despite his poorly timed run – trophy-wise that is – in Don Revie’s Leeds United team (1962-1967), Bobby Collins played just as big a part in the Don’s success as those that followed. In many ways, Collins helped lay the foundations for Bremner, Clarke, Gray et al to go on and make their mark on history, whilst the man himself became a somewhat forgotten side-note. In his first year at the club, the diminutive yet hard-as-old-boots midfielder helped Don Revie guide Leeds clear of relegation to the third division. In 1964, the ageing Scot was also pivotal in the Leeds United side that won promotion to the First Division (now re-branded as The Premier League). Leeds’ first season back in the top flight saw them miss out on the league title by goal difference to Manchester United and lose in the FA Cup final to Liverpool. Nevertheless, Collins’ influence didn’t go unnoticed and he was duly named the 1965 Footballer of The Year. His Leeds career would ultimately be cut short by injury as the now 35 year old Collins suffered a horrific injury during a European match in 1966. Age and failure to recapture previous form meant his days at Leeds United ended before he could see rewards of his hard labour. Nevertheless, those of a certain age will never let his work go unappreciated at Elland Road, ensuring the legacy of the man is passed down from generation to generation – and deservedly so. Less warrior, more cultured some may argue, but Peter Lorimer was never a man to shy away from a tackle. Renowned for his ‘ninety miles an hour’ free-kicks, Hotshot was a rare breed of midfielder who could not only get stuck in and help Leeds in a defensive manner, but also offered an attacking threat few teams could contain. Starting his career for Leeds at just 15 years of age, Peter Lorimer was such an attacking threat that to this day, he still tops the list of all-time top goal scorers for Leeds United with 238 – some 81 clear of second placed John Charles. His goalscoring legacy is testimony not only to the strength of his shot, but the amount of appearances he made for Leeds United, 726 in total. Since retiring from football, Peter Lorimer has continued to play an active part in the club and to this day serves on the board of directors at Elland Road. He also runs a pub in Holbeck called The Commercial and has remained in Leeds since his retirement. After losing his first team place at Manchester United, Howard Wilkinson brought Gordon Strachan to Elland Road in 1989, where the £200,000 transfer fee was soon justified as the hard-working, red headed Scot helped Leeds United to promotion in his first full season with the club. 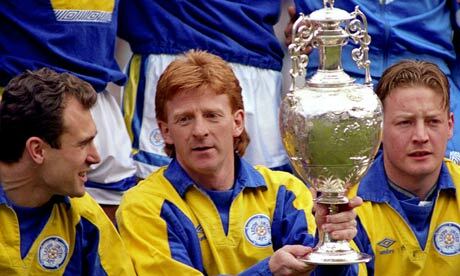 Gordon Strachan remained a big influence the following year as Leeds United finished fourth and the Scottish midfielder was voted The Football Writers Player of the Season 1991. But Leeds United fans fondest memories of Gordon Strachan will be his performances that helped Leeds beat former club Manchester United to be crowned First Division Champions in 1992. The hard-working Scot formed part of a formidable Leeds United midfield, largely recognised as the key to Howard Wilkinson’s success. As midfield warriors go, none come close to ‘the captain of the crew’ Billy Bremner. Voted the Greatest Leeds United Player Ever and with a statue outside Elland Road, the Leeds United fans appreciation of Bremner is clear. His combative style however did lead to individual and team criticism from the press and neutrals. Few were willing to accept Bremner was a highly skilled, hard-working and tireless player whose combative style was more a necessary approach that was indicative of most players in his day and age. Football back then, was as much a battle of physical endurance and strength as it was skill and finesse. Luckily, Bremner had both. Should Queens Park Rangers be docked points?